Honor, the smartphone brand for the young at heart, launches the Honor 6A, presenting another smartphone at an unbeatable price. The new device is a true smart companion – especially for those who are looking for a high-performing phone. The Honor 6A features a 13MP main camera for clear and impressive images. Each snap shot can be caught with precision with the 0.3-second PDAF (Phase Detection Auto Focus) technology, making it easier for users to capture their life moments. The 5MP front camera conjures bright selfies, while the beauty mode makes sure that each image shows oneself at their best – ready to share with friends and family on Instagram, Snapchat and Facebook. The Honor 6A combines a clean cut design with outstanding performance. Only 8.05mm-thin the smartphone comes with 2.5D glass and a slim but robust metal unibody, slightly curved to lie comfortably in the user’s hand. Its compact 5.0-inch display provides HD indulgence on the go (1280×720 pixel). 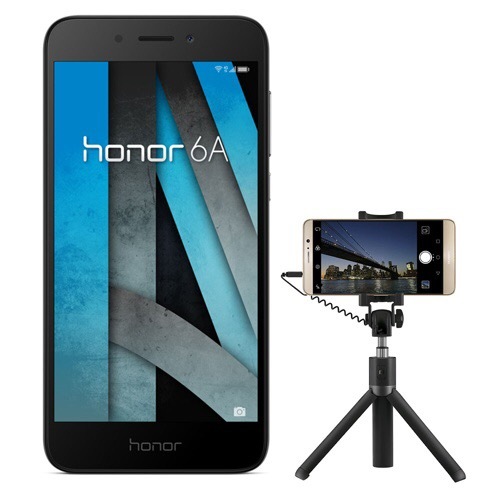 It’s not only the outside of the Honor 6A that has been carefully designed. The smartphone also features upgraded functionalities, the latest software and technical details that provide all essential information at one’s fingertips. The Honor 6A features Android 7.0, combined with the newest EMUI 5.1, making all applications easy to use. Powered by a fast Qualcomm Snapdragon MSM8937 octa-core processor with 4 x 1.2GHz and 4 x 1.0 GHz, the Honor 6A enables users to enjoy messaging, surfing the net or gaming without disruptions. The 2 GB RAM and 16 GB ROM, extendable to up to 128 GB with a microSD card, offers enough space for all songs and images. LTE Cat4, VoLTE and Wifi 802.11b/g/n ensure that owners of the Honor 6A are always connected, while the 3.020mAh battery provides power for up to 1.8 days of normal usage or 1.2 days of heavy usage. The standard version of the Honor 6A in Dark Grey will be available to pre-order on VMALL today starting from 31st July 2017 for a RRP of £149.99. Each purchase includes a complimentary black tripod selfie stick. The Honor 6A is also available on PAYG for a RRP of £149.99 and a variety of contracts with exclusive network provider Three UK, starting at just £11 a month on a 24 month contract with no upfront cost. It will be available at Three from August 4. My full review of the Honor 6A will be coming soon. Hi Gavin, as an Honor 5c and Huawei Nova owner I agree that they make great phones for the price. I still have no idea how they manage to get this much battery life, the software seems to be extremely smart. One possible issue is the missing LTE bands 7 and 20, though – at least here in Germany they are used in the rural areas. I am not sure about the Honor 5C or Nova, but I am sure the Honor 8, 8 Pro and Honor 9 have band 20 in the UK. No idea about band 7 though without checking.